A big hit at my son's birthday party! Sturdy travel case will help keep track of the earbuds! This was a favorite in the gift bag! Look out for more orders! Excellent and fast service and help! Thank you! Within an hour after placing my order, I was provided a mock up to review! I was slow to respond but they stayed on top of getting my response so I didn't miss my dead line! Thank you for the excellent service and I will definitely purchase again! I highly recommend!! I really liked the favors I ordered for my daughter\'s graduation. They were unique and fun to use. Very satisfied with my purchase. 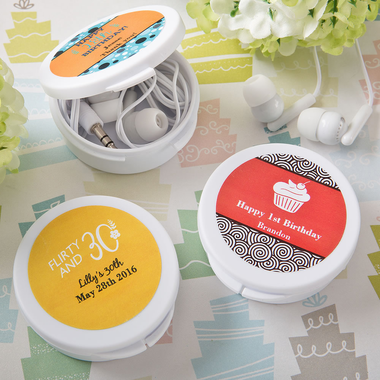 QUICK service, cute labels and good quality product! Will order again.